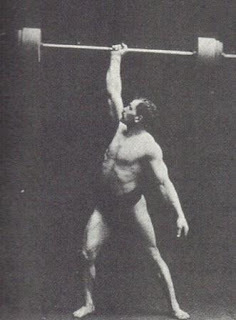 Despite the fact that we live in times where modern science has made great achievements and has come up with inventions that make life way too easy, I often wonder why do a great many of us still look back to old time strongmen to learn how to get stronger and fitter. Why does a guy in his 20's today still look back to the 1970's, 80, or even early 1900's to learn how to train? Why has there been this resurgence of "old school" strength training in the recent years? Why are the methods used by Arthur Saxon, Eugene Sandow, Paul Anderson of sudden interest to so many trainees? Nowadays you have a lot of sites on the internet which contain information of ONLY old time strongmen and bodybuilders. And these sites have a great number of followers, which demonstrates the popularity of the old time methods. But if you were to compare the modern day records in the deadlift, squat, bench press to the earlier ones, then you will find that the modern day strongmen are quite ahead of the old time strongmen. Of course one did not have squat racks and benches in the early 1900's so it might not be a fair comparison, but the deadlift was there. Plus if you look at modern day bodybuilders, then you will find that they are far bigger and more ripped compared to the old time bodybuilders. So definitely numbers cannot be the reason in this case. 1) Simplicity- in our daily lives, we often say that life has become too complicated and stressful these days, and that in the old days, life was so much simpler and had much lesser stress. The same perception is also attached to old time strength training. In the old days, there were far less training equipment available, and one had to get focus on the basics to get strong. This made it a lot simpler approach, compared to modern times where you are often taught about using a bunch of supplements even before you have lifted a single pound. The basic formula in the old days was to simply eat good food, train hard, and get a good night's sleep every night. Compare that with modern times where you will be taught how dairy, grains, non organic meat, fruits, etc are bad for you, along with super complicated programs to isolate muscle groups, and of course supplements to help you train harder, improve digestion, and even supplements to help you sleep better. No doubt that modern science has helped us a lot, but I also believe that theses days a lot of unnecessary things are being given far more importance that what they deserve. This makes for a lot more confusion and hassle. 2) Natural appeal- lets be honest, modern day bodybuilders who weigh 275 pounds at 5 feet 9 inches with a bodyfat % of less than 5% are anything but natural. Yes, they train hard and all, but its not what the average man can get even close to. To a lot of us, the sight of unnaturally huge muscles can be a major turn off, and seem impossible. On the other hand, the bodies of Eugene Sandow, Steve Reeves seem much more attainable for the regular man who trains naturally. Now to be honest, I do not agree that most men will be able to build as much muscle as Steve Reeves did, but they can atleast get a lot closer to Steve compared to Ronnie Coleman. And this fact itself makes one want to train and make an attempt, rather than give up without even trying. 3) The look of toughness- many trainees look at oldtime strongmen as being tough and strong willed individuals. Most gyms in the old days did not have the facilities nor the comforts that many modern day gyms have. There were very few (if any) air conditioned gyms, and many just had a few barbells and a pull up bar at max. Yet, these old time strongmen never backed away, and kept pushing hard with the limited resources that they had. They made great progress with little equipment and tons of mental toughness. This fact relates very well with people who train at home, or in similar gyms with very little facilities, and makes the old timers a bigger inspiration than modern day strongmen who train in well equipped gyms. 4) The appeal of both internal and external health- a lot of people believe that the oldtime strongmen were healthy, both internally and externally. There is a belief that modern day strongmen overuse steroids and are thus not healthy on the inside. While I do not fully agree with this belief, I do feel that the lack of steroid usage did give the edge to oldtime strongmen, in terms of long term health. They relied more on healthier habits to get strong rather than take drugs to get strong and huge. This belief alone makes old time strength training appealing to many trainees who wish to focus on both internal and external well being. There are definitely more reasons as to why old time strength training is making a comeback, but I feel that these four reasons are the main ones. Whatever it maybe, I do feel that there is some value in looking back and studying the methods used in the old days. Those guys had a lot of good things going for them, and we can definitely learn from them. Infact a lot of great exercises which were forgotten, are making a comeback thanks to the study of old time strongmen and their methods. And as mentioned earlier that for those who train at home and have minimal equipment, the methods used in the old days might be more suitable and useful.